"Creation as Intimate Partner" in Seven Days, Seven Voices: Insights into the Biblical Story of Creation, edited by Benjamin David (CCAR Press, 2017). "Seeking a Wild Heart in Wilderness" in A Life of Meaning: Embracing Reform Judaism’s Sacred Path, edited by Dana Evan Kaplan (CCAR Press, 2018). "God’s Reset Button (Behar)" in The Modern Men’s Torah Commentary, edited by Jeffrey Salkin, (Jewish Lights, 2012). 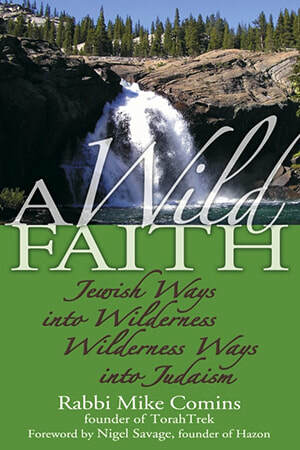 "Going to the Wild Places (Behar-Bechukotai)" in Text Messages: a Torah Commentary for Teens, edited by Jeffrey Salkin, (Jewish Lights, 2009). "Praying in Crisis" in The Jewish Book of Grief and Healing: A Spiritual Companion for Mourning, edited by Stuart Matlins, (Jewish Lights, 2016). "A Psalm in Memory of My Father" in Jewish Men Pray: Words of Yearning, Praise, Petition, Gratitude and Wonder from Traditional and Contemporary Sources, edited by Kerry Olitzky and Stuart Matlins, (Jewish Lights, 2013), pg. 163. "He’s Still My Father" in Broken Fragments: Jewish Experiences of Alzheimer’s Disease, edited by Douglass Kohn (URJ Press, 2012). "On God" in Lights in the Forest: Rabbis Respond to Twelve Essential Jewish Questions, edited by Paul Citrin (CCAR Press, 2014), pg 8. Introduction to Judaism Course, Edited by Rabbi Beth Lieberman and Rabbi Hara Person (CCAR Press, 2017), p. 388. 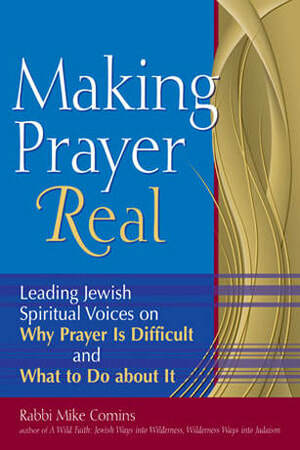 "In a spiritual dynamics approach, we ask: what do good pray-ers do when they pray? What goes into a transcendent moment and how do I make that happen more often? We explore topics such as putting heart into words, or connecting to our deepest yearnings, or we ask: what does the latest brain science teach us about teshuvah and self-change? God-ideas are not critical: we let God-ideas arise when our experience makes them relevant. Instead, we concentrate on what is critical: the skills of spiritual practice that produce God-moments." "Ask a person where they feel God's presence, in a sanctuary or on a mountain, most will prefer the natural setting to even the most beautiful of buildings. Ask whether they are moved more by a synagogue service or a day walking in Yosemite, most will choose the latter. Of course, the comparison is unfair and does not rule out a positive experience in shul. Nevertheless, the Jewish people suffers when its leaders do not understand the implications of these facts." Elijah and the "Still, Small Voice"
​"Does reading a biblical story in the place it occurred affect one's understanding of the text? I have had the privilege of guiding groups comprised largely of rabbis and rabbinical students through the central Sinai mountains. With their help, I have repeatedly studied the story of Elijah at Horeb/Sinai while sitting under the shadow of present day Mt. Sinai. The interpretations of this episode in Elijah's life are endless, and none has achieved definitive status. The story, as we shall see, is too complex for that. Each reading leaves a thread or two or three untied, as does the midrash/interpretation offered here. It is my hope that this reading will contribute, quite literally, a new perspective to the discussion: the view from Sinai." "Prophets, kings, monks – they have all gone to the desert. Some as political refugees, some as spiritual seekers. Some have searched for God, some have been accosted by burning bushes. Today, more and more people are following our ancestors into the desert, but it is hard to see the desert they experienced. The ancients did not tour in air-conditioned jeeps or hike with state of the art camping equipment at their disposal. To follow our predecessors spiritually, we must try, at least, to feel the desert as they did." As a congregational rabbi, I dreaded High Holy Day services. The regular attendees who join in the singing, know their way around a service and like to pray, are suddenly a minority. Why do “once-a-year Jews” find their way to Rosh Hashanah services? My guess is a sense of loyalty to the Jewish people, which I admire and applaud. But I doubt that they are there because of the prayers; they are there despite them. "From her beginnings as a Jewish city, Yeru-shalem, whose name includes the Hebrew word for wholeness, sat on a border for the purpose of uniting the people around it. King David chose for his capital a Jebusite city, located on the border between two of the twelve tribes (Judah and Benjamin), rather than his powerbase, Hebron, the capital of his own tribe of Judah. Jerusalem the border town offered a challenge to unite the twelve tribes around a new center. So too can Jerusalem's other borders be understood as challenges, as calls for integration rather than division." "Tu b’Shevat may now be at its most popular moment in Jewish history, but I would argue that it is not prominent enough. When I look at the ideas and activities attracting the next generation, my judgment is that Israel, environmentalism and spirituality are in the top five. Tu b’Shevat combines them in a unique historical, political and moral context that demonstrates the vitality of Jewish culture and the creativity of the Jewish people. " "According to the rabbis, the holiday of Sukkot commemorates the 40 years of wandering in the Sinai Desert, and we eat and sleep in a sukkah— that temporary structure made with a roof of dried vegetation, such as palm fronds — because the Israelites slept in sukkot (the plural of sukkah) on their journeys. But this contradicts the Torah. The Israelites lived in tents in the Sinai. The prophet Balaam does not praise Israel against the wishes of his patron, Balak, by exclaiming, “How lovely are thy huts … O Israel” (Numbers 24:5)." Following the sin of the Golden Calf and Moses’ advocacy for the people, he makes a personal request. He asks to see God. This is somewhat surprising, as we have just been told that God, in the form of a cloud, regularly meets with Moses “face to face” in the Tent of Meeting. But this is apparently not enough, or not the real deal. Moses ups the ante and requests to see God’s kavod, a term usually translated as “honor,” but in this context, clearly refers to God’s physical being. Readers have long been challenged by the blatant contradictions between the first two chapters of Genesis. In chapter 1, the creation of animals precedes people; in chapter 2, the order is reversed. In chapter 1, a single, androgynous Adam came into being; in chapter 2, Adam and Eve. More interesting is that the two chapters show different concerns about the human condition, which modern biblical scholars attribute to different schools of (human) authorship. I still remember that random day in the yeshiva when I read the dissenting opinion of the 12th century rabbi and grandson of Rashi, Shmuel ben Meir, the Rashbam: “Jacob was left alone … in order to flee a different route where he intended to avoid Esau. And a man (ish) wrestled with him so that he would not be able to flee …” What? Jacob, the father of our people, was preparing to abandon his family and run? Is that possible? Unfortunately, it makes sense. Jacob fled twice before — once from Esau and once from Laban. He never stands his ground. What did the new generation need to learn? The standard interpretation, which is undoubtedly correct, is that the stories in Bamidbar were written to emphasize the Israelites’ dependence on God, Who provided navigation (the pillars of fire and smoke to guide them), food (the manna), protection (the Israelites prevail in battle when Moses raises his arms to the heavens) or lack thereof (the plagues). Unfortunately, this is difficult to digest. Why would those who witnessed the plagues against the Egyptians, the parting of the sea, the destruction of the pursuing chariots and God’s appearance at Sinai, lack faith, while their children did not? ​“Beware of being lured into their ways … Do not inquire about their gods, saying, ‘How did those nations worship their gods? I too will follow the same practices!’” (Deuteronomy 12:30). I am struck by this verse from our parasha, because I have benefited greatly from other people’s religious practices. My ability to do teshuvah has been transformed by a style of meditation that I learned from Buddhists, and tai chi has taught me how to bring my body into davening. Some of the time, we do the right thing because we weigh the moral calculus and conclude that it is the highest good. But most all the time, we are attracted to truth and goodness because in the realm of spirit, the right and the true are beautiful.